So, my sister Jenni and I were having a conversation the other day that got a little out of hand. incredibly weird that you’re weirded out right now by the weirdness? real life to mimic what we see around us. On the day in question, we were being child-braggers. excreting out of every orifice, and now, get this, she can count to 18 and she only misses 12 and 14, but the thing that makes it really special is that she is only two freaking years old. Well. Maybe not every parent. 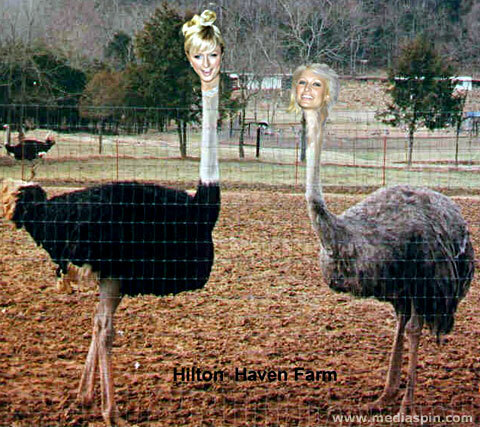 Paris Hilton had ostrich babies. There’s not a lot of hope for genius there. verbal, huh? That sounds like a bit of a brag. Look what you just started. Me: Oh, has she? Has she been really verbal? Like extra verbal? Like maybe more than other kids? Me: Oh, how cute that you think she’s so young for that! we didn’t know how to keep up with her active imagination! Nor do we speak French! Jenni: Oh… no. I’m so sorry. You didn’t know. was so, so proud of her, and you should be too! math teacher that “doesn’t get” her students…. yesterday and explained that she was suspicious that this might happen. Daddy, Alice is saying SHE solved the quadratic equation first, but she used the wrong variable! By this point we were laughing too hard to continue. you feel the same way about mine. *For the record, my daughters actually are geniuses. Anna, for example, drew a picture of a rainbow yesterday that had eight different colors. So, yeah. Obviously there are exceptions, and I am one of them. c. Is working on solving P=NP, hoping to answer one of the 7 Millennium Prize Problems by the Clay Mathematics Institute this year. d. None of the above, she’s only two, can barely talk, and not even potty trained. (Give me a break, I’m employed full-time and a half and pregnant). But she’s a joy to have and we all love her. She loves to care for her baby dolls and change their diapers. She thinks Santa is called “ho ho ho” she’s a cutie. @Taren–THAT'S funny. I like it a lot. I especially like c. I might steal that idea some future Christmas. @Taren — That's hilarious! I always make fun of the really braggy Christmas cards we receive. i think all children are amazing and wonderful but I must say i do believe i have the most perfect child ever born "wink"
@Taren (again)–It's official. You have just proved that my readers are hilarious. If y'all aren't reading the comments 'round these parts, you should be. They make me laugh, OFTEN. @Glow–Yeah, child-bragging is at its finest at Christmas card time, for sure! Alice read this post and was mildly offended. I suggested she go work on the symphony she is composing to blow off some steam. Worked like a charm. I mean really…they are bilingual. Because I'm German. Although I'm sure they sound like idiot children to others when the speak English with German sentence structure. Oh well, we just try to be humble about our geniuses. @Jenni–That made me laugh. I <3 u. @Franziska Patterson–Bilingualism? Totally awesome. And I completely understand how hard it is to be humble when your child is a genius. It's such a burden… *Viva walks into the room chanting "one-three-five-six-one-three-five-six" then runs into the wall and starts crying* Yes. Yes. Such a huge burden. This is exactly why I love play groups- an open forum to brag and display our children! Oh… you weren't invited to our playgroup? It is for Gifties Only. But we have a Peer Mentor group where our children are available to help those less fortunate.